If you wanted a single sequence that summed up Philadelphia's dream 2017-18 season, you got it with just over a minute to go in the final game of the year. One rebound away from a triple-double, rookie guard Markelle Fultz soared through the air toward a Brandon Jennings miss, coming down with the rebound over Milwaukee's Thon Maker. The Wells Fargo Center erupted, showering the kid whose jumper went missing with the sort of love that usually takes years to earn. But it was the reaction on the floor that mattered most. T.J. McConnell, the guy who has seen his role shrink since Fultz's return, was the first Sixers player to hunt down his teammate on the floor, half-hugging, half-attacking his peer under the basket. He was engulfed by his teammates, who have a much better understanding than most do just how much it took for Fultz to get back on the court at all. The unselfishness and unity that has powered this team all season has never been more evident than it was right then, with the Sixers closing out a dominant 130-95 victory over the Milwaukee Bucks to end the season. And it was the first thing their coach pointed to when he had the opportunity to speak about the game, forgoing analysis and cold-hard facts to revel in a special moment for his teenaged rookie. If you said what was the most impressive thing of the night, that's mine. I wasn't aware he was that close to a triple-double. 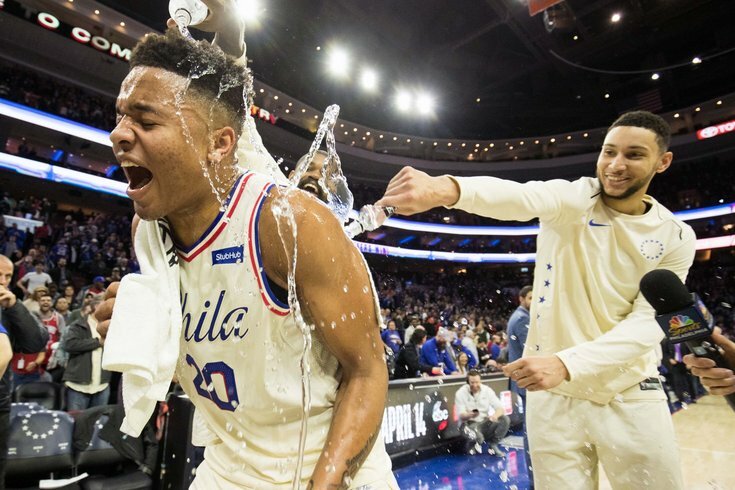 To see his teammates react to Markelle Fultz was special. I think it's a snapshot into who these guys are, I think it's a real-time example of how — you've heard me say, "They play together, they coexist, we pass the ball," and this and that — that's real. It doesn't require a coach throwing out some math. There's a human side to that action that is special. You would have to be legally dead to not feel a certain way after seeing what Fultz went through, knowing how much scrutiny has faced, only for him to come through on the other side with such an undying, unburdened love from the guys who suit up with him day after day. His absence for most of the season could have easily divided Philadelphia's locker room, serving as a point of animosity for a group that desperately needed skills he brings to the table. But it had the opposite effect, drawing the circle tighter around him while the people outside the building grew impatient. Perhaps that's because, beyond being a great human story, Fultz's triple-double was a great basketball story. He didn't play a perfect game, shooting 6/13 from the field in the process of piling up 13 points, 10 rebounds, and 10 assists. There were sequences that were flashy and exciting but ultimately fruitless, like his second-quarter dunk attempt that would have split the Earth in half had it gone down. But that sort of line embodied the effort and spirit he played with on Wednesday night. As if he was unshackled by the early success of his teammates, Fultz played his best stretch of the season in the first quarter, helping Philadelphia kill the game off before the Bucks ever had a chance to get rolling. It was his engagement all over the court that stood out more than anything. If there was a loose ball to be had, Fultz was going after it, and on more than one occasion he turned hustle plays into scoring opportunities for the Sixers. Whether he has his jump shot with him or not, the thing Fultz can control the most is his effort, and that has not been a question at all during his brief time back in the lineup. "I always believed in myself, I always knew what I was capable of, it was just a matter of going out there, enjoying myself, having fun and playing confident," said Fultz. "I want to go out there and help the team in any way I can, go out there and put my life on the line. Every single game, every time on the court, I just go out there and play as hard as I can and I'll live with the results. As long as I know I went out there and put out a good effort, I'll be fine." The beauty of Philadelphia's blowout victory was that they were able to reward Fultz's effort with more minutes, allowing him to stretch his legs and build up his fitness before he's thrown into the playoff pressure cooker. Philadelphia has drawn the Miami Heat in round one — a matchup we'll explore in more detail over the next couple days — and they'll play tough, physical basketball that will make life even tougher for the rookie guard. So every rep he was able to get before that test is critical. Wednesday night, though, was about a lot more than reps. It was a kid who dealt with one of the most drawn-out sagas in recent NBA memory dealing with an unfathomable amount of scrutiny, pushing away his detractors and skeptics for at least one night. It was a celebration of a journey for a team whose playoff chances were often scoffed at. The Sixers continue to put people in their rearview mirror. If you're not on the bandwagon yet, now may be a good time to grab the bumper and street surf. I don't want to overvalue a sample that is so small — especially given the overall quality of their opponents during the stretch — but Fultz's minutes at the end of the year are a complete departure from what he offered early in the season. He graded out as one of the team's least effective and most actively harmful players back then, which is no surprise given what he was going through, and has flipped that completely heading into the playoffs. His role has a lot to do with that. By allowing Fultz to be Simmons' understudy for the time being, the coaching staff has empowered Fultz to be the same dominant ballhandler he was as an amateur player. When Simmons hits the bench, the Sixers now have a player who can push the tempo in a manner similar to Simmons and create in the halfcourt for himself and his teammates. Even if the end product hasn't caught up, he can be breathtaking in the open floor, and he is slowly finding the right balance of attacking and playmaking. Fultz's handle — which might be his biggest strength at this point — allows him to control the ball while leaning into opponents, and that bit of separation he creates often leads to open looks for teammates. In a short amount of time, his running mates have figured out what lanes they need to fill if they want to get the ball in transition. Several times against Milwaukee, Fultz threaded gorgeous bounce passes to hit his buddies in stride for layups. Fultz's assist-to-turnover ratio closes at better than 3:1 to end his rookie season, and the second unit has thrived when he has been on the floor recently — the Sixers currently own a +5.7 NETRTG when Fultz is on the court, a massive departure from where he was and where some expected him to be following a long layoff. Perhaps that's why Brown did not hesitate much when asked about Fultz's inclusion in the playoff rotation before the game, asserting that he expects his rookie to remain in a similar role to the one he's in now. "It will come with deeper thought and a clearer answer when I know who we're playing," said Brown. "But in general when we got him back, it was my desire to see him, and you're always weighing that up in what you have with T.J. ... if the playoffs started tomorrow, I would expect we will continue on with what we've been doing." One night after being knocked out with a dental issue and one week after struggling through a shoulder problem, Saric finally rediscovered his groove in a blistering performance against the Bucks. While you can credit some of his success to porous defense from Milwaukee — Jabari Parker should have just put a recliner on the side of the court the Bucks were defending in each half — it was absolutely a return to form for Saric at a time when he needed it. Instead of heading into the playoffs with a string of poor performances in the back of his mind, he heads into Saturday's matchup with Miami on a high, having contributed 24 points on 10/19 (3/7 from three) shooting on Wednesday. If there's a member of the young core I'd be least concerned about in the playoffs, it's Saric. He has to make due on a nightly basis with an athletic package that often puts him at a disadvantage. But it has a perverse sort of benefit, too — Saric has grown so accustomed to getting by with that skill set that he has mastered his control of that domain. Milwaukee had absolutely no idea what to do with him on Wednesday night, and he beat them like a drum using little more than clever ball fakes and subtle moves in the post. The story will remain the same in round one. Saric will unleash his arsenal of up fakes, be counted on to knock down shots, and battle for every rebound like his life depends on it. That's a guy you want in the foxhole with you. With JJ Redick scratched late due to tightness in his lower back, the Sixers needed to come up with another contributor on the wing to eat some of the minutes voided by their top shooter. In stepped Justin Anderson, who went from out of the rotation to the team's leading scorer in the blink of an eye. Along with Richaun Holmes, who ran the floor at every opportunity against a Bucks team that wanted nothing to do with it, Anderson gave the Sixers an athletic edge they sometimes concede by playing the likes of Marco Belinelli and Ersan Ilyasova. That's not a criticism of those latter two guys, who bring tons to the table through shooting alone, but there will always be a place in the rotation for players who hop into a game and mix things up. It has been an up-and-down season for both players, with Holmes buried in the rotation due to defensive concerns and Anderson never really able to find his footing due to a series of minor injuries. When you're not included in the lineup for long stretches of time, it's not especially easy to jump back in the mix and hit the ground running. But Anderson's musings after the game revealed part of why he was able to succeed on Wednesday. Anderson credits a fresh perspective picked up on the sidelines for his success on the court Wednesday night. "One thing I really found out [this year] was being able to control what you can control. What I can control is my work ethic, doing extra cardio, getting up extra shots, going to the gym at night, just waiting patiently and waiting my turn," said Anderson. "I got an opportunity tonight and I tried to make the most of it." Without spoiling the series preview too much, the Heat are a hard-nosed, physical team who can throw lots of athleticism at you in waves. The Sixers would be happy to play more of a finesse game given their overall personnel, but barring a perfect performance they're going to have to play on Miami's terms for at least small stretches of the series. When that happens, guys like Anderson and Holmes are strong candidates to throw into the mix and jumble things up. I wouldn't expect Brown to throw a lot of curveballs in his first journey into the playoffs as a head coach, but matchups become more important than ever and these guys can help them counter what Miami brings to the table.